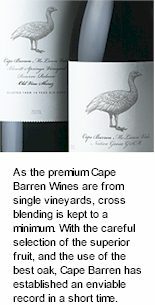 Grenache Shiraz Mourvedre by Cape Barren of McLaren Vale. Juicy red and dark berry fruits, a supple, medium to full bodied palate, structured layers of red berry fruits and fragrant trade spice, allsorts and chocolate box, vanillan carob oak, long lingering, raspberry tannin finish. From sacred blocks of old, to very old Blewitt Spring vines, mostly Grenache and Shiraz, with a judicious measure Mourverdre. Structured, seamless and lingering, an amazingly well rounded palate of ingratiating alcohol warmth, the whole bunch Grenache contributes a sweetly pungent, spicey lift.